What did Albany eat in the 18th century? 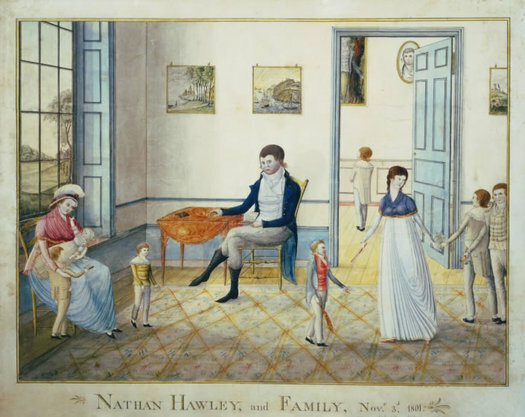 This scene depicts the Hawley Family of Albany in 1801 -- it was painted William Wilkie and is part of the collection of the Albany Institute of History and Art. We're coming up on the end-of-year holidays and many of us will be serving a lot of the same holiday foods -- turkey, ham, sweet potatoes, stuffing. Sure, we all have our own versions of holiday foods, but there are plenty of similarities. So what about people who lived here, say, 200 years ago? What did they serve at their holiday tables? 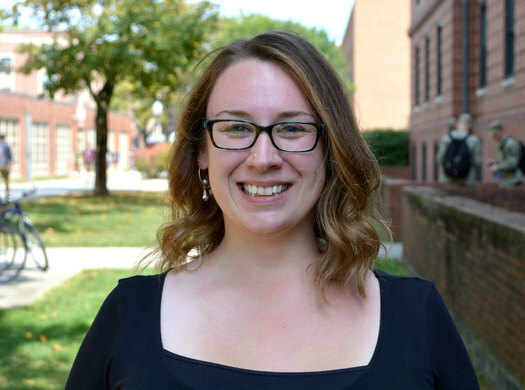 Sara Evenson, an MA candidate at Virginia Tech, has been researching 18th century food history -- and she's particularly interested in Albany cuisine from that era. She'll be giving a talk about some of her research at the State Museum Friday afternoon as part of the Researching New York conference. We chatted with Evenson about how 18th century food here differed from what we eat now, and about what would have been on holiday tables back then. What fascinates you about 18th century food? I love the 18th century because there was so much going on, and a lot of times we don't realize it. If we try to define what was typical for Albany, for example, we have to take into account Native American, African American, Dutch, Palatine, English, and French influence and see how all these cultures worked together to create a food identity. I'm also fascinated by accessibility. Again, you'd think that the 18th century meant limited availability of trade goods. That was definitely not the case! Locally grown items were definitely a staple and were important, but they also had ready access to imported goods like sugar and spices. The Van Rensselaer collection has four different recipes for coconut something -- "Cokernut Tarts," for example. By the 18th century, not everyone were subsistence farmers, though they most likely kept basic kitchen gardens. Was food as big a deal back then as it is now? By the 18th century, we'd moved beyond the basic need for survival. Food wasn't just sustenance at this point. It was a tangible form of culture, even for individuals living in hinterland areas. That's why it's so important that Amelia Simmons published American Cookery in 1796 -- it was an American cookbook written by an American. It was an attempt to identify what was an American cuisine. Prior to that, cookery books in the colonies had been imported or were reprints of British cookbooks. Many of these books released subsequent editions that included sections about what would appeal to Americans, or how to incorporate American foods. So what would have been on the table at a holiday celebration in 18th century Albany? It really depended on who you were. Of course, those with more means had a greater ability to celebrate. I focus on everyday 18th century American foods. As far as I'm aware, there was no one set traditional menu for the holidays -- how/if you celebrated varied greatly depending on your socioeconomic standing and cultural background. To three pound flour, sprinkle a tea cup of fine powdered coriander seed, rub in one pound butter, and one and half pound sugar, dissolve three tea spoonfuls of pearl ash in a tea cup of milk, kneed all together well, roll three quarters of an inch thick, and cut or stamp into shape and size you please, bake slowly fifteen or twenty minutes; tho' hard and dry at first, if put into an earthen pot, and dry cellar, or damp room, they will be finer, softer and better when six months old. As you can see, the concept of a Christmas cookie has evolved quite a bit! Pearl ash is potassium carbonate, a leavening agent used before baking powder or baking soda. You don't see much mention of this until the late 18th/early 19th century. Prior to that, yeast and whipped egg whites were the chief leavening agents. These cookies would turn out to be something like shortbreads, with caraway seeds in them. The taste palette was very different at that point in history -- flavors that we wouldn't necessarily consider complimentary were often put together. And, of course, the composition of ingredients was also entirely different! Sugar was brown, hard, and coarse, and frequently had to be clarified before being used. Flours produced prior to the AWI were produced from wheat varieties of European origin. Soft-kerneled wheats were easier to mill during the 18th century, since they require steady pressure throughout the milling process to produce a satisfactory flour. Hard kerneled wheats that became more common in the 19th century required more pressure to break their outer shell initially, but were subsequently easier to grind. This soft-kerneled wheat is lower in protein and has a higher gluten capacity which makes it behave differently from, say, modern all-purpose flour. The closest modern equivalent would be something like pastry flour. As far as special meals, I can only speculate since I haven't found any direct citations for this. I do know, however, that there were certain dishes within aesthetic and gastronomic norms for the time. Beef a la Mode, for example, was one of those dishes during the 18th century. You find some variation of this dish in just about every imported cookbook. But my favorite comes from Hannah Glasse's The Art of Cookery Made Plain and Easy, published originally in 1747. It involves a roast of beef that you wrap with bacon, and then braise with vinegar, onions, herbs, lemon peel, and spices -- nutmeg, mace, salt, pepper. Pepper could mean black pepper, or potentially what was called Jamaica pepper, which is modern allspice. Bear in mind that these spices are whole, unground, so you would "beat" them or grind/crush them before using. I love this dish! It comes out tasting like a fresh corned beef and is really delicious. Kitchen work back then often involved a lot of time-consuming work. This is three pounds of butter that Evenson churned herself. So you recreate these recipes you find? That is one of my favorite things to do! Food is a universal -- everyone has a relationship with food, and because of that it is a great place to start a conversation about history. I frequently make 18th century cakes and 19th century breads. It can be hard to read historic receipts if you're not used to them. There are often times no particular measurements. Instead, "take a teacup of" this and "add enough flour to make a thick batter." It takes some experimenting. What is something people ate here in the 18th century that we might think kind of outrageous today? I find the change in taste palettes fascinating. Pairings that we, as modern eaters, would think were crazy weren't. In the Beef a la Mode recipe I sent you, for example, the spices for a roast beef includes mace, nutmeg, and (maybe) allspice. Nutmeg on beef? That seems kind of outrageous to me as a modern person. But, if you can move beyond your modern sensibilities, it really tastes phenomenal! We also as modern eaters are used to heavily sweetened foods. One of the recipes I'm sending you involves custard, and it won't be as sweet as pudding or modern custard. The first time I tried it, I didn't like it. But, after thinking about it and trying it again, I came to appreciate tasting each of the different ingredients without sugar masking everything. You can taste the apple, you can taste the egg and the milk. It just goes to show how a simple dish can pack some serious flavor. Cup cake is about as good as pound cake, and is cheaper. One cup of butter, two cups of sugar, three cups of flour, and four eggs, well beat together, and baked in pans or cups. Bake twenty minutes and no more. Cream one cup of room-temperature butter with two cups of sugar until fluffy. Whisk in four eggs until well-combined. Stir in three cups of flour, one cup at a time. Mix until just combined. Pour into a greased, 8" spring form pan. Bake at 350 degrees for 30-45 minutes, or until a toothpick comes out clean. This cake will be dense, and should not be frosted. You can also add one cup of currants or raisins to the batter before adding the flour if you would like an extra special treat. A version of this recipe made by Sara Evenson. 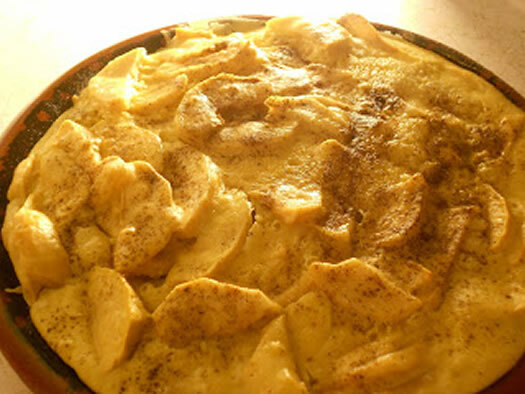 Beat six eggs very light, add a pint of rich milk, pare some apples or peaches--slice them thin, make the eggs and milk into a tolerably thick batter with flour, add a small cup of melted butter, put in the fruit, and bake it in a deep dish--eat with sugar, butter, and nutmeg. Core and slice 4 baking apples. Layer in a pie dish. Pour the batter mixture over top of the apples, and sprinkle with sugar and nutmeg. Bake at 350 degrees about 45 minutes to an hour, or until a toothpick comes out clean. Notes: I mixed my sugar and nutmeg together prior to sprinkling over the top. A few tablespoons of sugar with 1/2 teaspoon of nutmeg should do it, since you want to add some subtle spice/sweetness instead of creating a sugar crust on top. + Drawing: Capital District Food Tour tickets + Honest Weight gift card: If you had to pick one food item to represent the Capital Region, what would it be? I loves me some historical Albany foodways info! Wouldn't some of those dark, heavy spices (ones that the modern palate -- not palette -- associates with sweet) serve the purpose of covering up the flavors of questionable meat? It appears that Albany in the 18th century was still adhering to medieval and Renaissance flavor profiles with their sweet, strong spices. Adam Gopnik, in "The Table Comes First: Family, France, and the Meaning of Food," writes of revolutionary changes ahead in 19th century French cooking under the influence of the chef Careme where the brown spices were replaced by brighter tasting fresh green herbs (such as tarragon). Now apparently the cycle is turning back and modern cuisine is once again appreciating the darker, deeper ancient spices, the sweet married to the savory. Fascinating research, and Sarah Evenson's perspective on interpreting old recipes with modern ingredients seems right on. I am particularly interested in leavening methods. Would pearl ash have been made at home, or is it something you'd buy at a general store? And does she have any perspective on the use of salteratus later in the 19th century? I would ask these questions in person but am committed this pm and can't make the talk. Will it be recorded or a transcript made available possibly (hopefully)? Thanks. 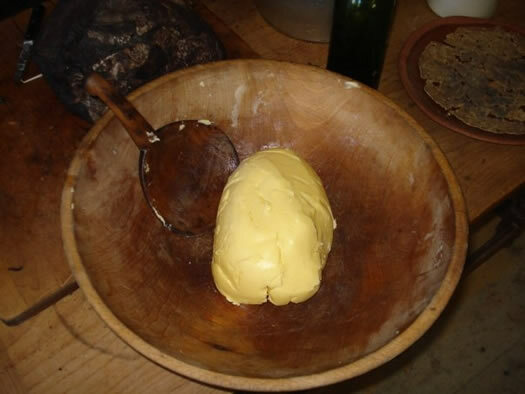 If you want add a little 18th century to your Thanksgiving celebration, nothing beats churning your own butter. Luckily I have a Cuisinart, so the process took minutes vs hours. 1c heavy cream, sea salt to taste. Add herbs to taste on enjoy the rich creamy flavor plain. I swear you will never buy store bought butter ever again. Jamie's idea about making your own butter for your Thanksgiving feast is a great idea and reminder of where our food comes from. But let me suggest that it can be a fun activity for children before the meal. Fill a mason jar with a cup of heavy cream and a marble and let the kids shake it until the butter separates out. The kids can hand the jar back and forth and make it a contest to see who finally makes it into butter. Then pour off the liquid (the buttermilk -- save for baking) and knead the clump of butter into shape, adding salt as desired. I've done this with groups of kids in museum programming and it's a hoot and could become your new Thanksgiving tradition. It's easy and fun and will blow the kids' minds. Although I've always been taught to consider baking as something that needs to be very precise (and I have recently switching over to weighing ingredients, rather than scooping measurements), I have seen that in some European baking (Irish, particularly), measurements tend to be a little less strict than here. For example, to measure a "cup" of flour, they'll use a mug out of the pantry, and for a teaspoon, a regular ol' flatware spoon. Then again, when the recipes are made so many times, the baker learns from experience what the right amount is for "enough flour." @Burnt My Fingers - I've seen old ads for makers and dealers of pearl ash so it seems at least some of it was purchased. That New Year's cookie recipe is just what I've been looking for, actually. I'm interested in recreating doodkoeks which were "dead cookies" passed out at Dutch funerals in the 18th and early 19th century. They've been described as very similar to Dutch New Year's cookies except usually spiced with anise or caraway instead of coriander. They were often embossed with the deceased initials or even a coat of arms. Great research with excellent writing!